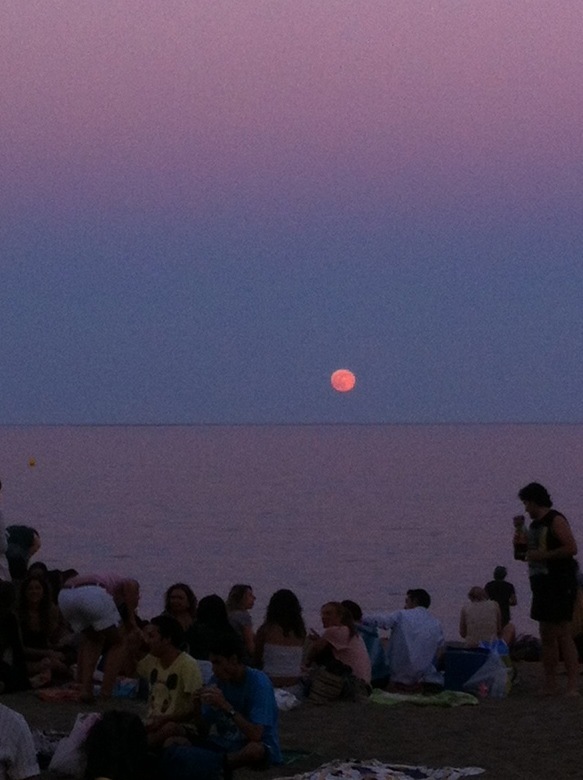 Magic was most definitely in the air as the fates conspired in the best possible way, and not only put La Noche de San Juan on a Sunday but also ensured it coincided with a super-moon – the biggest and brightest full moon of the year, closer than usual, and causing lower low-tides and higher high-tides. Coming so close on the heels of the solstice just two days before meant it was lower down than usual, creating a huge orangey-red orb on the sea’s horizon. 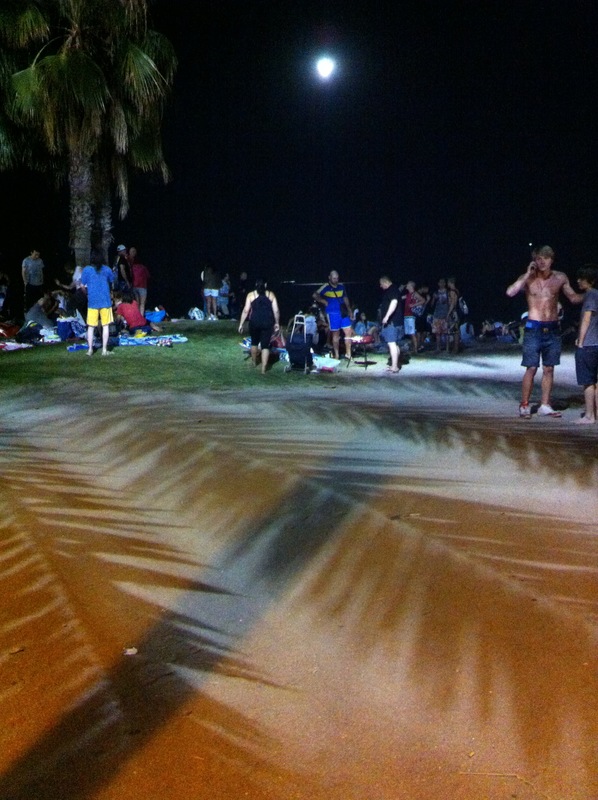 All of which combined to bring what seemed like the entire population of Spain onto the beaches on Sunday night. Presumably somewhere way back there’s some religious relevance to this festival (it is, after all, the Night of St John the Baptist), but what was on clear display was a traditional coming-together to enjoy the beach, share a barbecue with friends and family, and take part alongside thousands of others in a string of pagan rituals. 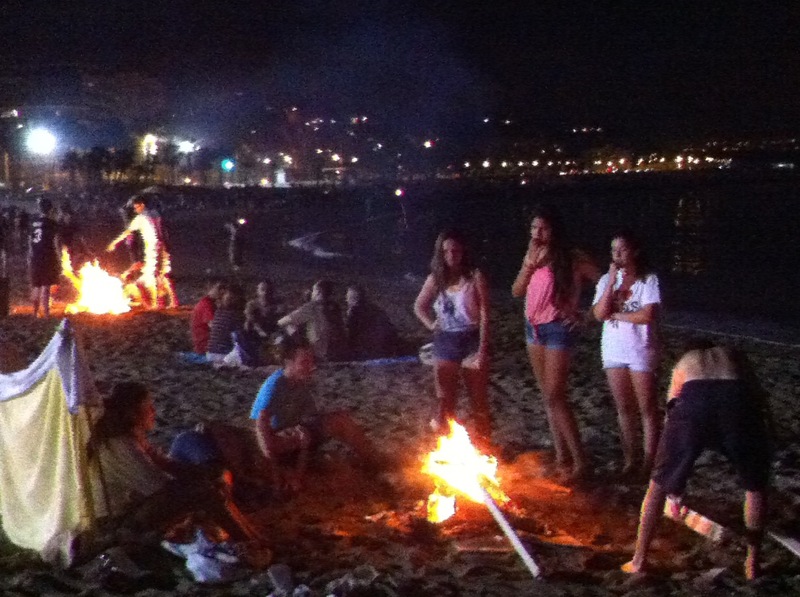 Of course it all began with the lighting of fires – Las Hogueras de San Juan (Los Fogueres de Sant Joan in Catalunya). On the Malagueta beach in Málaga city there was barely a towel space to be had, and smoke spiraled upwards in the still air. Around 10pm most fires were functional, cooking food, and keeping warm the brave swimmers who had been in and out of the sea all evening. Food shared and consumed, the fires became less tidy and were merged with those nearby to create bigger bonfires, now stoked with planks and old broken furniture saved for tonight. As midnight approached, all of a sudden the sky above Málaga was filled with flaming lanterns, hovering way above us, and visible many kilometres away in Nerja. On the stroke of midnight there was a surge towards the sea. 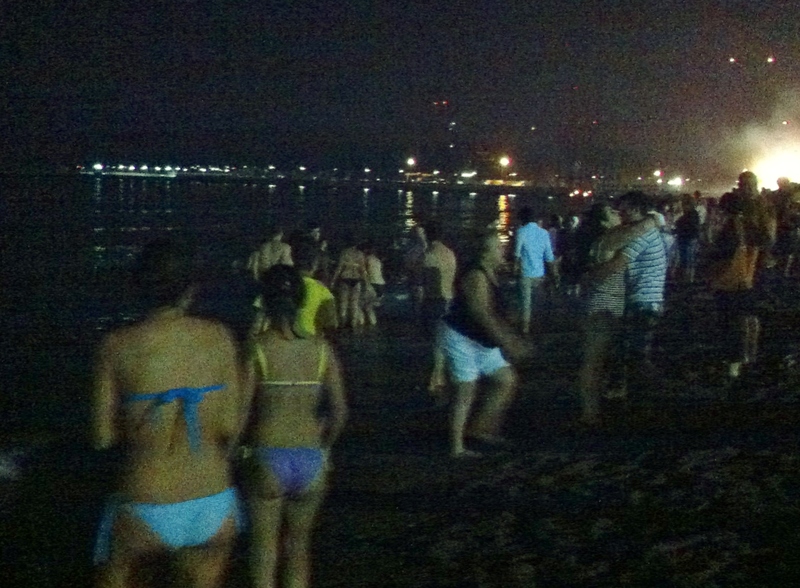 Whether naked, in bikinis or shorts, or fully-dressed, almost everyone went in at least ankle-deep. Particular care was taken to wash the feet properly, cleansing us of sin, and guaranteeing good luck for the coming year. A few older couples, or groups of women, were perhaps casting back to a time when San Juan was celebrated in a more reverent fashion. Sitting quietly on a blanket, they sheltered their lit candles from the merrymakers. Not disapproving, and not separate, they brought to the evening their own thoughts – and probably their prayers, which throughout the rest of this night of revelry were largely absent. Some of the lads, fuelled by San Miguel rather than San Juan, jumped three times over their bonfires, further ensuring their sins were fully cleansed (or, more likely, ensuring that the girls were impressed!). Bonfires ….. sharing food ….. a full moon ….. the shortest night of the year ….. a mass washing of the feet …. 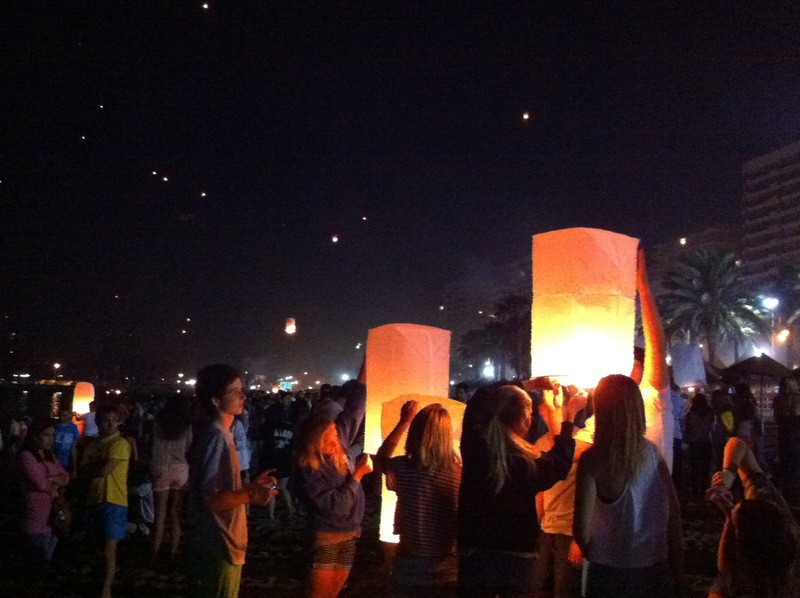 lanterns sacrificed to the moon and the wind. In many northern hemisphere countries this is the night that represents change. The fire purifies, destroys, and the phoenix rises again from the ashes to recreate. The water recuperates, refreshes, and rejuvenates. Myths tell us that pagan gods appear on the shortest night, and inexplicable things occur. Back in the UK a similarly bizarre ritual occurred two nights before. The Filly Loo, in the tiny Dorset hamlet of Ashmore near my home town of Shaftesbury, is the kind of festival that would confirm many people’s worst fears about “The West Country” and if somebody’s sat-nav accidentally took them through the village on that night it could give them nightmares for many a year. The flaming torches, the village pond, and the bonfire create obvious parallels to the San Juan festival …. and the Filly Loo’s antler men, the Green Man, and mournful music share the pagan roots demonstrated on San Juan. These crucial dates in the calendar, the changes of seasons, the coming of new life, bring disparate parts of the world together in innate and instinctive ways, sharing a reverence for nature and the rich cycle of our year. And if none of that, well, it was a great excuse for a barbie on the beach! Volver – to return. Buying a return train ticket – ida y vuelta. But used much more frequently about “doing something again”. Ha vuelto a escribir de nuevo. He/she has started to write again. Hemos vuelto a hacer deporte. We are back to playing sport. Has vuelto a recuperar tu vida. You are recovering your life anew. Phrases including this need quite “free” translation – as in these three examples, you can use any English phrase that sounds right and means coming back to something or doing it again. This entry was posted in Dorset, Spain and tagged Andalucia, Axarquía, fiesta, Málaga, pagan, rituals, San Juan, Spain, SpanishBlog by tamaraessex. Bookmark the permalink. Yes that was your tip-off! 🙂 By the way – next week’s blog is about you Marianne!!! Did you see ours in Salobreña? No Málaga would be too far west Josh, but Marianne might have, as Nerja is sort of half way there! Yeah I know lol. Imagine how amazing it would be if someone had taken a huge cliff looking back along all the coastline with the fires and lanterns floating upwards! Fingers crossed someone did it and they post it online! *taken a huge photo of a cliff! Great writing and pics Tamara ( I loved the moon) and do I detect a touch of the pagan among your influences?! I’m not a follower particularly, Hugh, but pagan rituals and stories inform so much that is in modern organised religions – though that is often suppressed by (for example) the Christian churches. For me, pagan rituals seem to be simply about nature, its cycles, and a basic connection to the earth and our environment. Which is why they so often make sense. Very true Tamara I was introduced to the “old religions” by an old friend in the 60s who combined being a white witch and a Labour councillor! Excellent as always Tamara. I thoroughly enjoyed reading this & the photos were smashing.